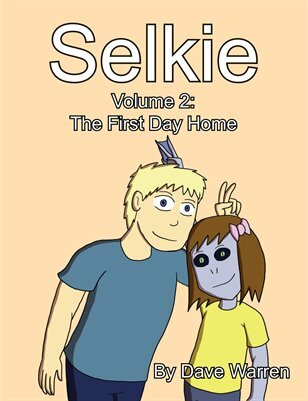 Selkie and George, go follow all the other kids in class and get off-panel. Jessie is one of my favorite secondary characters for a reason. She’s got a good heart. in other words: you DO realise they´ll get bullied like woah, right? I’d imagine Then would say something like “good thing you guys are around to clamp down on that, then”. The Guppies have likely been cautioned against using it, and Selkie knows better. If it comes up, someone put their hand where they shouldn’t have. I am curious – we know Avery is aware of the bullying Selkie’s received, but I can’t recall if Then is. I think he’s at least vaguely aware of it, but not sure if he knows the nitty-gritty. He was there in his invisibility suit when the old principal got canned for it. you do realize that they are alpha predators in thier own right? I like the expression, but the art in that first panel just kinda throws me off, somehow. To the point where at first glance, I thought it might be a guest strip; both characters look off-model (not much, but noticeably). Maybe Dave was a bit rushed? My guess is that George gets gills about the same time that Selkie gets laser beam eyes. So George, those gills are on there way! Did- did these precious angels wear/dye their hair green to match their new students? Oooh, good catch! I hadn’t noticed that. Kinda scared that grown ups’ll do something terrible. YES! Someone asks the Real question! I love Jessie, she is awesome. I’m hoping that this will give Selkie a chance to be something like a leader (or at least to teach her about compassion) she will be the one to be able to tell the other Sarnothi kids what stuff is what in the human world, help them with gill-flushing (and after her incident with the shirt stealing I expect that any Sarnothi kid needing to flush their gills will be very accommodated and possibly assigned a buddy to watch out for them). And she can point out which kids are bullies and to avoid them. Also, with the history of Selkie being bullied and the trouble it caused (wrath of authority coming down) and the fact that the new Sarnothi leader blew their cover and everyone knows they are a race of people not just a “genetic condition” there will be more legal protections in place. While in America there exists the Americans With Disability Act that is supposed to afford legal protection for people with a disability, but it is pretty easily ignored and disregarded. We also have laws protecting asylum seekers, but we have seen how this administration treats people fleeing an untenable situation- takes their children, puts them in cages, and then sends them right back into danger. Well thankfully the president of this comic’s USA is FICTIONAL instead of Trump, so that’s already a one up for him. You know, for six years I managed to enjoy this comic, and leave my thoughts on the illegal alien sitting in my White House out of the comments. Why don’t you try to do the same, and leave YOUR politics out of this strip. By all means let’s try to leave current US politics out of the comments, Alpo, but it really sounds like you’ve misread Biblioholic’s post, which was pointing out a danger, a potential plot complication, not suggesting it would be a good thing! You actually have very similar political opinions, so perhaps… just dial it back a little. Not gonna lie, skirting aside real world politics is half the reason WHY my setting uses a fictional president. (avoiding dating myself too much is the other half). And frankly I’m weary of being inundated 24×7. I kind of look to webcomics as a welcome distraction from the real world. Just something for other commentators to think about, please. I love Jessie too. For all the reasons you just stated. I’m going to agree with Alpo too, can we keep current politics out of this? I can’t tell if Then is unsure of George’s gender or just flabbergasted that this random kid has asked him for gills. Either way I approve.